Some of the many attempts to adopt, update, or reimagine Sherlock Holmes have run aground on the misconception that Holmes is a social crusader who cares deeply about right and wrong, whose first commitment is to seeing justice done. Elementary—like Stephen Moffat’s Sherlock, and like House when it was good—understands that Sherlock Holmes is an artist, an obsessive whose first commitment is to keep himself from being bored. From the start of this series, Jonny Lee Miller’s performance has had a muted quality that’s taken some getting used to; it’s only over the long haul of a few episodes that a viewer may recognize that the effort of staying sober really is taking a terrible toll on his Sherlock, and this leaves him only so much energy to expend on bug-eyed ranting. This puts him in the same category as any number of artists—musicians, actors, writers—who achieved some high-flying glories while they were chemically jacked up, and who now risk disappointing people who think that being an addict was an essential part of their legend and feel that, now that they’re healthy, they aren’t really “themselves.” Charlie Parker always told young musicians who wanted to try heroin so they could be more like him that he did his own best work when he was straight, but they found it hard to believe him, and may not have wanted to believe him; it would have meant that he was just that much more talented than the average person, and there was no magic syringe that would lift them up into the clouds with him, where they felt they belonged. There may have even been nights, when he was having trouble focusing on the music because of how badly he wanted a fix, that he wanted to believe it himself. Of course, as one of Sherlock’s street contacts once bluntly put it, Sherlock doesn’t have any friends. Rhys is irresistible to him because Rhys is a fan, an inveterate admirer who has come to him for help because, he says repeatedly, “I believe in Sherlock Holmes.” Back in London, Sherlock had him deliver some cocaine to Scotland Yard, then, after getting lit, invited him to watch him rock during an interrogation, and one suspects that Sherlock may have just been showing off a bit. Having Rhys around gives him the chance to get a buzz from his memories of those days when the thrill of the deductive process and the thrill of the high must have seemed inseparable, and also gives him the chance to demonstrate his natural superiority to those who have to play by the rules, who aren’t “a man like me.” But what Sherlock doesn’t anticipate is that Rhys may be frustrated by the slowness of the process, which looks a bit more plodding and trial-and-error than it did when Sherlock was juiced up and incandescent. He’s respectful for a while, but as the hours tick by, he begins to suspect that Sherlock may need his medicine. “Get yourself right,” he urges, playing what, as a British druggie of a certain age and temperament, he imagines as his trump card: He points out that the Stones haven’t made a good album since they stopped snorting and shooting up and took up jogging. Inevitably, he produces some white powder and practically waves it under Sherlock’s nose. These scenes are much more effective than they’d be if Rhys were played by a conventionally villainous actor with a flair for being the Satanic tempter. Hannah and Miller have the intimate but edgy rapport of two guys who were never really friends but who’ve done things together that most friends have never experienced. And though he doesn’t want to hurt anyone, his concern for his daughter—who he’s barely had contact with until her connection to him put her in danger, which only intensifies his guilty desperation—has him ready for anything. But he also wants to see what he once saw in that interrogation room in London, maybe as badly as Sherlock would like to feel that way again. He wants to believe in Sherlock Holmes, but believing in Sherlock Holmes probably used to be more exciting than this. The episode goes a little soft on Rhys at the end, giving him a heroic, self-sacrificial moment after Sherlock has told him that he wants him out of his life. The villain’s identity, when it’s revealed, doesn’t make a world of sense, but I still felt that I didn’t guess it earlier, just because the possible options are so thin on the ground. 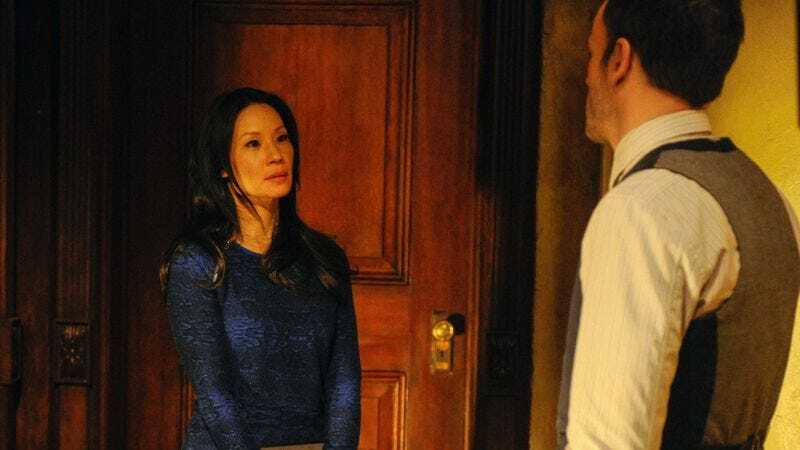 But the actual mysteries haven’t always been the most memorable thing about Elementary, and the mystery may matter less to this episode than any of the earlier ones. Certainly the fact that the solution to the mystery doesn’t matter all that much doesn’t seem to matter to how satisfying the episode itself is. I seem to recall some precedent for this back when Arthur Conan Doyle was acting as Sherlock and Watson’s front man. Looking for clues as to the daughter’s whereabouts, Sherlock examines her Twitter feed, which gives him an excuse to share his theories about this “suffocatingly inane… excruciating medium,” which is so “soul-crushing in its banality” that it “demonstrates that brevity does not protect against boredom.” I don’t know that this is necessarily intended as a slap at the Stephen Moffat/ Benedict Cumberpatch Sherlock, who, you will recall, is an enthusiastic practitioner of social media. I do think it’s interesting, though, that both approaches feel equally valid as plausible modern takes on Conan Doyle’s hero. Myles sends his regards, and will return next week.